Back to back carb posts? Don’t mind if I do. This is obv a treat in a few ways. One, I don’t plan on spending 2.5 hours every Wednesday so fresh bagels are at the ready. Two, I don’t need to eat the equivalent of 7 slices of bread first thing in the morning on a regular basis (unless I’m hung over in which case I need about 2983720823 bagels to feel better- cue my gfs laughter because they’ve all seen me do this). I went through a ton of recipes and the one I used from Sophisticated Gourmet seemed the most basic/fast. Place 0.5 cups lukewarm water (warm but not so warm you would bathe in it) in small bowl. Sprinkle on top 1.5 tablespoons granulated sugar and one packet of dry active yeast (2 teaspoons). 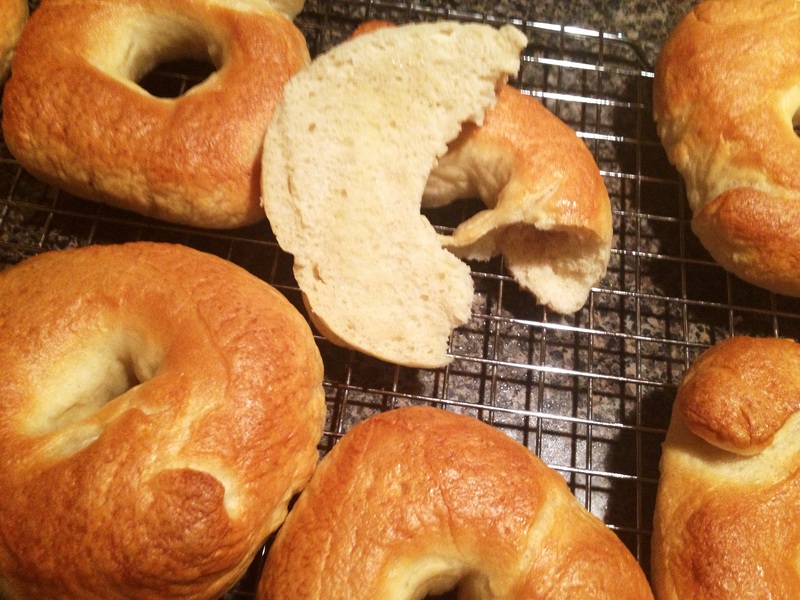 Don’t stir and spend five minutes thinking about what kind of cream cheese you’ll put on these bagels. After five minutes stir the mixture until the sugar and yeast are dissolved in the water (mine didn’t look perfectly dissolved and I would still eat all these bagels in one sitting). 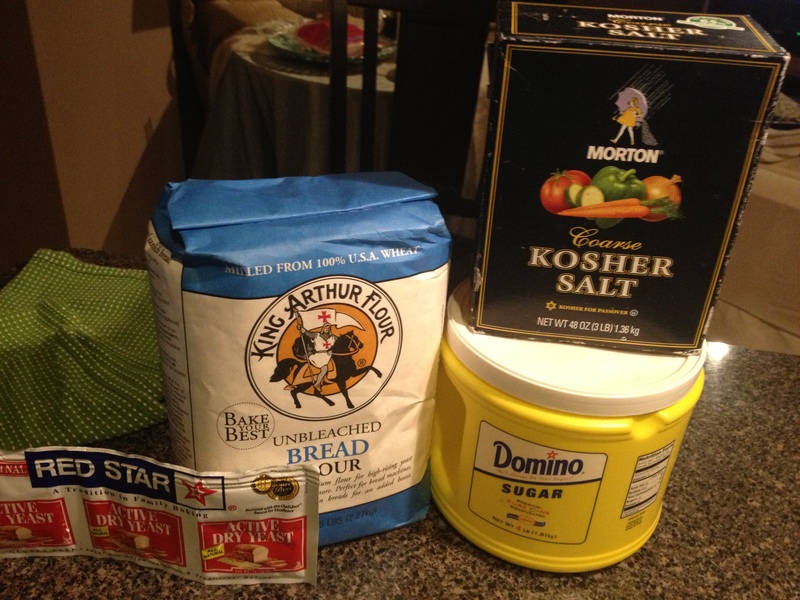 In a large bowl mix 3.5 cups of bread flour with 1.5 teaspoons of salt. Make a well in the center (so smush the flour up the sides of the bowl and make a little hole because we’re pouring in your awesome yeast mixture you did so well with). 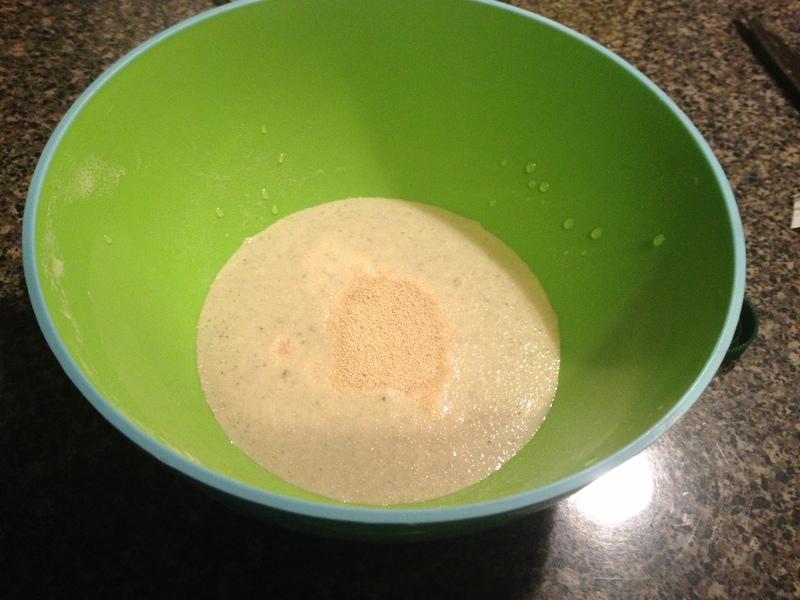 Pour in the yeast and sugar mixture and an additional 0.5 cups of the warm water. Using a wooden spoon (and eventually your hands to make this into a dough) mix everything together. I had to add an additional 0.25 cups of warm water to make this thing look like a dough. It should be moist but firm (mine was definitely firm). 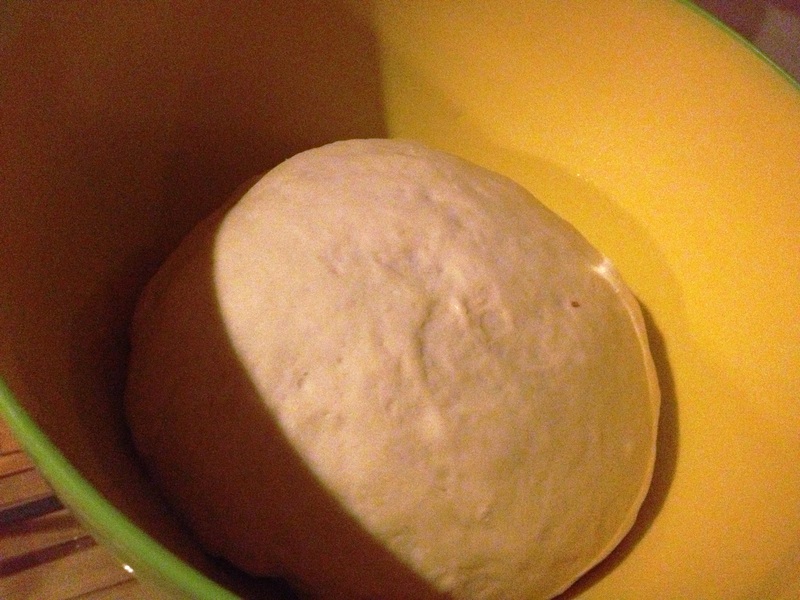 On a floured surface knead the dough for 10 minutes. This. Was. Exhausting. Bread flour is a high gluten flour and it fights back. Just accept that this is your work out for the day. Lightly brush a large bowl with oil and put the dough in it. Turn it around a couple times so the dough has a layer of oil on it. Cover with a damp dish towel and let it rise for an hour in a warm place. If you’re like me you have the heat on full blast because you want it to be nice and toasty for your dough as it rises. You will also be in a tank top and shorts because you’ve been doing manual labor/kneading the dough and it’s 100 degrees in your apartment. 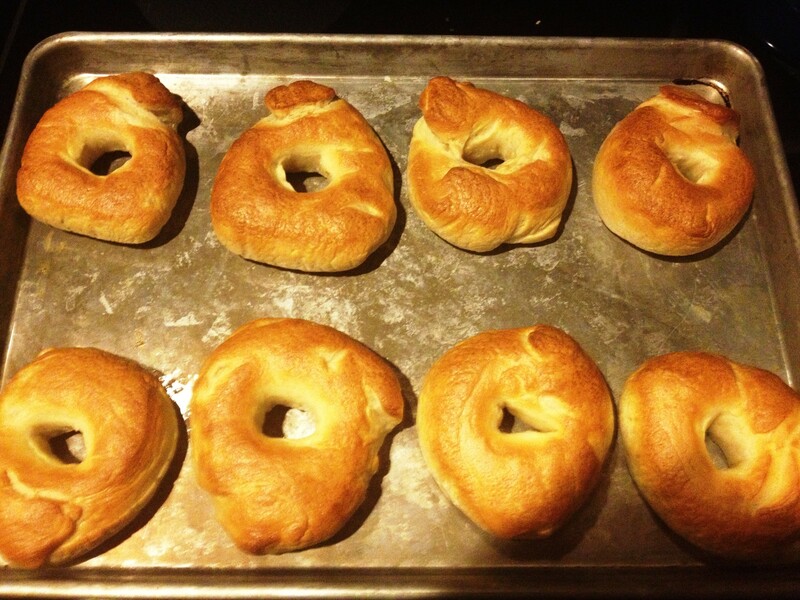 At this point your roommate will come home from a dinner you could have gone to but instead elected to make bagels. She will be in a floor length North Face because, turns out, it’s February. Look at yourself in gym clothes covered in flour and question your life. Now that the dough has risen punch it down and let it rise for another ten minutes. Divide your dough into eight pieces (I used my scale which is interesting because I cared how much the dough weighed but made little effort to make these look uniform/cute). Using your hand roll these eight pieces into little balls (as you can tell I did not put a lot of effort into making these nice/even shapes). 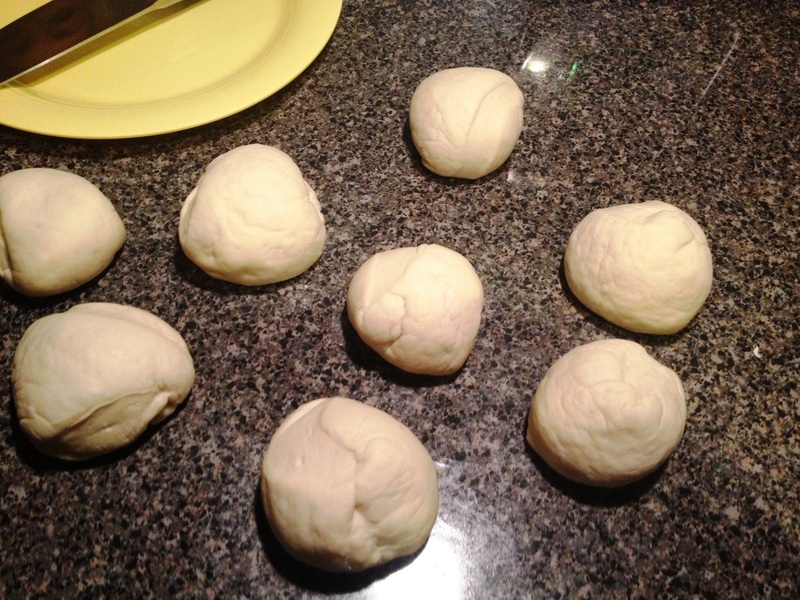 Stick your finger in flour and press it into the center of each dough ball to form a ring. 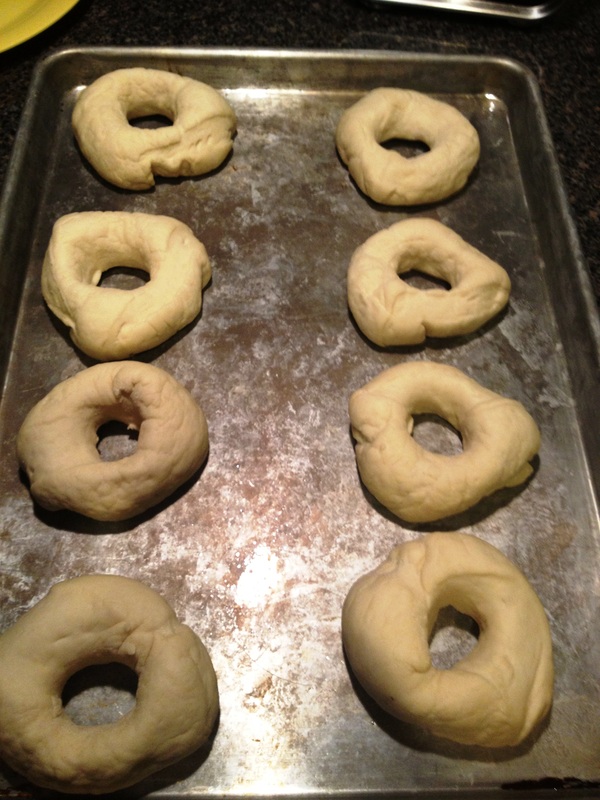 Then gently spread out the dough to make them look like a bagel. Place them on a cookie sheet, cover with a damp kitchen towel, and let rise for ten minutes. Turn your oven on to 425 degrees and start boiling water in a large pot. 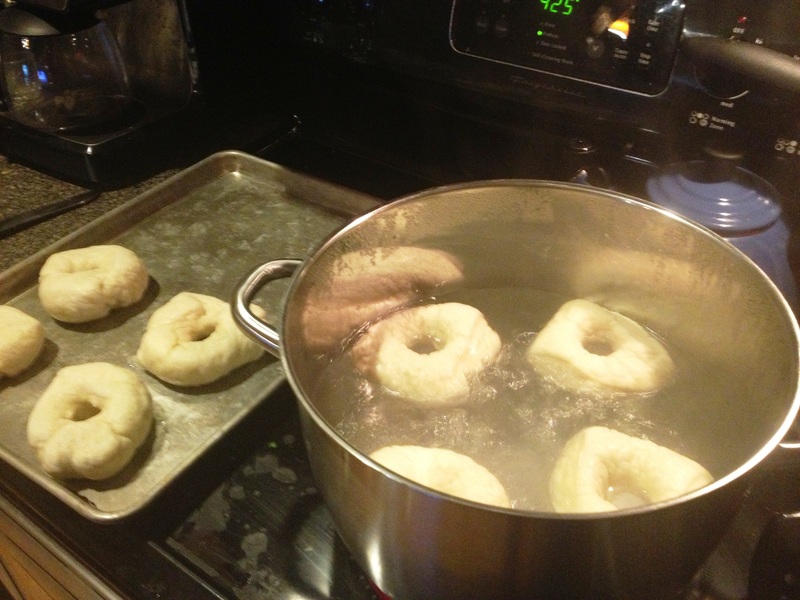 Once the water is boiling reduce the heat and start cooking these bagels in the water for a minute on each side. I used a spatula to place them in and take them out but a slotted spoon would be better ( can’t have everything). 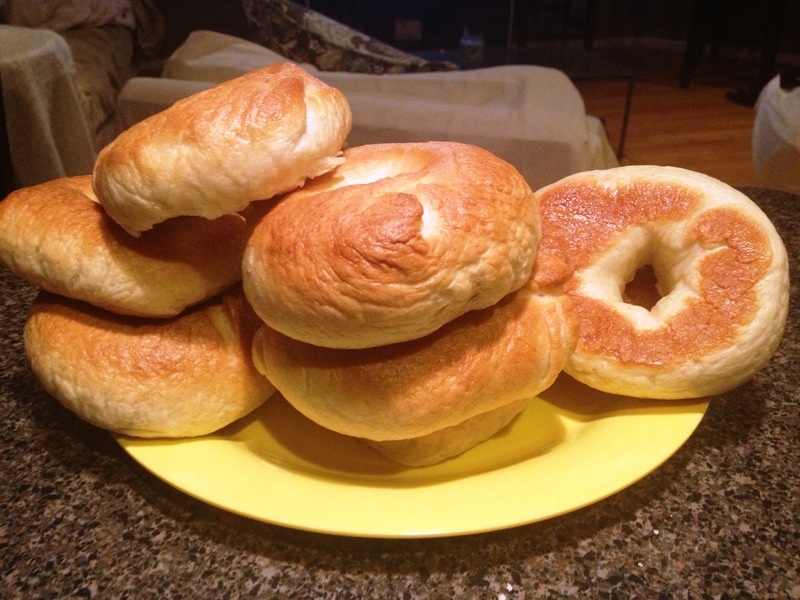 Place boiled bagels on a lightly oiled baking sheet and bake for 20 minutes. Rip one open in the least lady like way possible the second they come out because you are that excited to eat one. Yea they are pretty “rustic” looking but hey that’s how you know they’re homemade.